Sophisticated, Sumptuous, Olde Naples, our location is right in the heart of this MOST DESIRABLE area. Walk straight down our palm tree-lined street to the Gulf of Mexico and the famous Naples Pier for unmatched sunsets. The beach entrance is visible from our front drive. We are located on the corner of 4th Street, walk only 1 block to the elegant Third Street ShoppingDistrict with its fine choice of elegant restaurants, shops and galleries. You will be especially charmed by the offer of outside seating and light musical fare while dining. And all within a minute's walk! A ten minute walk brings you to another one of Naples famous streets, Fifth Avenue, with is own assortment of elegant shops, restaurants and galleries. Everything you've heard about Naples is in walking distance to our location. Or simply spend an evening around our beautiful 38 x 18 foot open pool and then cap off the evening with a walk down the block to listen to music at 'Tommy Bahamas' or 'Campiello's' restaurants. The back garden is completely private and surrounded by a 13 foot hedge on all sides. Our home is impeccably maintained, all bedding and towels are fresh and inviting. There are numerous chairs and umbrellas for the beach and several touring bikes, a great way to get around Old Naples. Our remodeled and professionally decorated luxury home will delight and charm you, antiques abound. The large foyer opens to living room, great room and dining room, all with view of pool. Enter through french doors to our guest bedroom with luxurious queen canopy bed decorated with custom upholstered bedding and chairs, all decorated in the Caribbean Colonial style. Master bedroom opens through french doors to it's own private screened lanai with access and view of beautiful pool. Second bedroom has elegant full size 1800's antique bed, abundance of charming touches will delight you. Plantation blinds throughout. It is truly paradise! A few blocks away is Cambier Park, complete with 12 lighted har-tru tennis courts as well as other sporting amenities. This park was voted #1 tennis park in the USA. The park hosts a lovely children's playground as well. A 5 minute walk in opposite direction brings you the City Dock for dining and boating with Tin City next door! If not booked with Echeck, credit cards welcome but guest is responsible for credit card fee. We are a retired couple, living on Long Island which is close to our family members, but our heart is in our charming home by the Gulf in Naples. Location, location, location. 4 minute walk to beach and pier, 10 minute walk to 5th Avenue, around the corner from 3rd Street Shopping District (the most desired restaurant location in all of Naples). It's all here. Walk to the Open Air Market on Third Street every Saturday morning. Walk to Cambier Park for tennis, shows, best children's playground and movie night. We purchased our home over twenty years ago, we were taken by the charm of the area and the proximity to Third Street and most importantly, the beach. In the years since many (most) homes in our area have been knocked down and much larger homes built. These homes utilize the backyard in the expansion. Our home is unlike others in that the back garden and pool are extremely large and provide a beautiful, tropical living area. Naples is about the outdoors and between the pool and a morning walk to the beach, then an evening stroll to dinner (no car needed) it is our paradise. The Naples Pier is on 12th Street, our home is on 13th Street, the entrance to the beautiful beach is visible from our front drive and 3 block away. Cambier Park is a short walk away and has 12 har-tru lighted tennis courts. Our house is located in the heart of the historic district. This is the most desired location in Naples. The local park, Cambier, is a wonderful facility with out door concerts, shuffleboard, basketball, tennis, and children's playground. They also have a playhouse. Our home is in walking distance to Fifth Avenue and Third Street Shopping as well as the Pier and beach. Boat rental and fishing excursions are in the neighborhood as well as a local surf shop where surf and paddle boards are available. You don't need a car to get to any of these amenities, you can walk to all. Third Street Shopping District (one block away) is a beautiful venue for shopping, dining and dancing. The palm trees are all adorned with Christmas lights year round. It's simply beautiful. This is a beautiful, quaint Old Naples home full of charm. Found everything to be clean and in good working order. Great location. Owner has thoughtfully left beach equipment for renters to use. Welcoming and comfortable home. Great home for a family. We were sad to have left just this morning. What makes the house unique aside from its fabulous location ( we walked to dinner, lunch , ice cream , coffee and the beach everyday)is that it so well outfitted. Great large pool with a ton of pool toys. Great bikes, mattresses & even comfy blankets to curl up with. Big TV and really perfect kitchen with everything you could ever need. Can't wait to be back. A beautiful home, and a wonderful location, this vacation home has everything you could possibly want. Decorated with an eye to casual elegance, with the most relaxing garden and pool. You can walk to everything, beach, shopping, great restaurants, but the best part of our vacation was just enjoying this perfectly appointed home. This is our 6th visit to this fabulous property in 5 years. We love it. The location is perfect, the house is beautiful and has so much character, the gardens and pool are stunning and it is exceptionally good value for money. If you are coming to Old Naples for a vacation - this is definitely the house to come to. We would not consider staying anywhere else and have already booked for 2015! 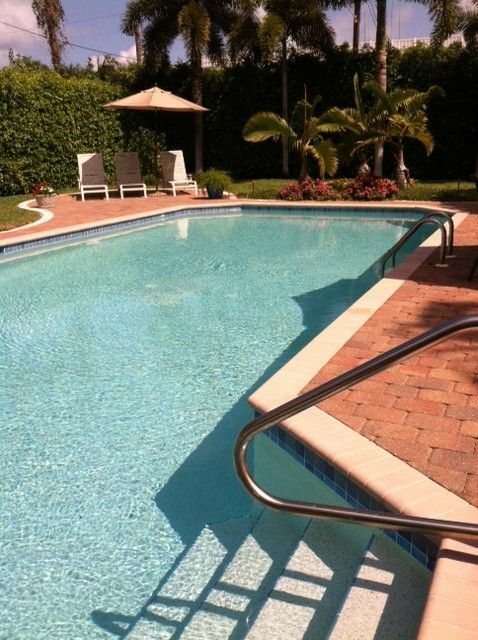 You are in the most desired real estate in Naples. We have the beach, the shops, the restaurants, the parks, Fifth Avenue, Third Street Shopping District all within walking distance or around the corner. Seasonal bookings (January, February, March) must be 30 days or longer.